Commonly called the Alexandrian laurel, Danae racemosa is one of the best low growing evergreen plants for dry shade. 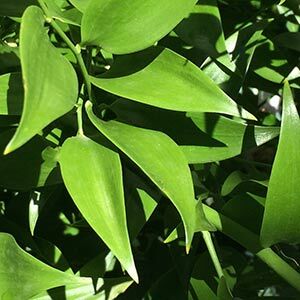 This is a plant that will grow and flower in deep shade, good mid green foliage year round, small flowers in spring followed by orange berries. Long arching canes form over time giving it a graceful appearance. It will reach around 80cm in height, however the attractive spreading habit is the main attraction to landscapers. The ability to grow in dry shade comes from the long tap root the plant sends down early on. This habit also makes it slow growing for the first few years. After 4 -5 years the plant develops to its full potential. This is a plant that thrives in dry conditions, excellent for beneath large trees. It gets its drought tolerance from the root system as well as the foliage which are actually flattened stems or phylloclades (Phylloclades simply mean ‘Leaf like branches’). Once established very little care is required. Light shade to deep shade. Well drained soil. Fertilise with a slow release type fertiliser in spring. Mulch around plants to maintain a cool root run. In very long dry periods, deep watering once a month may be required. Most gardeners look for potted specimens as this is very slow growing in its formative years. can be propagated from seed. It is slow and will reach less than 3cm in height in the first year, all of the action is down below as it develops its tap root. The next two years of growth are also slow and around year 4 it begins to hit its stride. You can also propagate from cuttings and by division of older established clumps. Pruning is easy once the plant has been established for 4 -5 years. Danae racemosa has a habit of letting its older canes die back and replacing them every 3 – 4 years. So a once a year prune back of dying or dead canes to the base of the plant is all that is required. The foliage is also used as backing in floristry, and sometimes cut for table decorations in up market restaurants. Danae racemosa – Alexandrian laurel is available for sale from the following growers.